This blog, is another in the Caring for Mother and Father at Home series of my sister Cindy’s insights as she cared for our father in his later years. Cindy noticed that Dad’s mental status could change dramatically and she had to learn to set up a safe environment for his care. One day I was assisting Dad from his bed to his lift chair. This was something that I did routinely as it helped with the change in his position and also helped him relax as he sat in his favorite chair. I took a break from caregiving for a moment and while my attention was drawn away, Dad bent over the side of the chair and somehow found the cord for the chair control. He pulled on it until he had it in his hands and then pressed the button that caused the chair to stand him upright. When I came back in the room he had fallen on the floor and though luckily unhurt, was very angry at what had happened. There was no way I could get him off the floor by myself. I had to call 9-1-1 to get them to assist me in putting him back to bed. I asked him why he would put the chair upright when he knew he might fall over and he said he wanted to see if his legs had started to work again. He was lucky to not have fractured his hip bone which is a common injury among the elderly. Lesson learned to make sure he was safely seated into his chair with no access to the lift control and necessary items completely within his reach. I did not have the caregiver training that certified nursing assistants have so every day was a learning experience for me. By mistake, I left a bottle of liquid antacid on Dad’s tray table after I had provided him with a small dosage in a cup. He had been having some indigestion, and he usually liked to slowly sip on the over the counter medication. This particular day he decided he no longer liked the medication because it was not alleviating his indigestion and he noticed the bottle I had left in his reach. He proceeded to dump the whole bottle of the thick pink liquid on the rug. When questioned on this decision, he said he felt the medication needed to be thrown out as it was no longer working for him. In retrospective, what if Dad had drunk the entire bottle of medication, thinking if a little is not helping, then maybe a lot will. We were both lucky his plan of action was to get rid the medicine instead of drink too much of it. Lesson learned to no longer leave any medications within his reach and to stay with him and watch him finish the medications that I have provided. I share these simple stories with you from my sister Cindy’s experiences to caution you to be alert for changes in mental status. Learn to expect the unexpected. 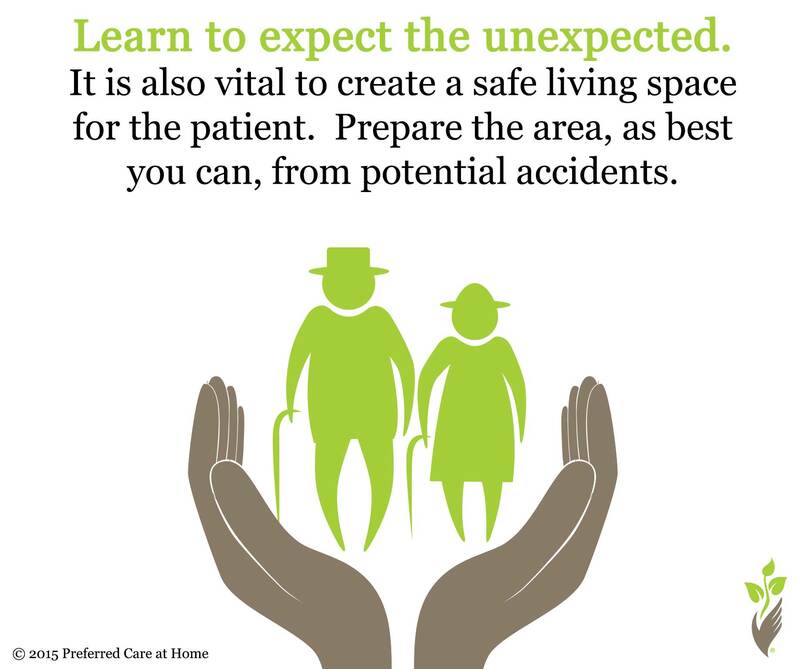 It is also vital to create a safe living space for the patient. Prepare the area, as best you can, from potential accidents. Health care professionals can help in this endeavor by completing a home safety assessment. They can analyze the home setting and give you instructions on how to prevent potential problems or accidents that might cause a hospitalization. Seek help from local Preferred Care at Home agencies on how to make your loved one safe at home so they can stay at home!